Photographer and artist Michael Chung took some time-lapse video of the Perseid meteor shower. That alone would have been worth watching. After all it was sure to be some beautiful footage of a rare event. But when he reviewed the video he was stunned at what he had accidentally captured. 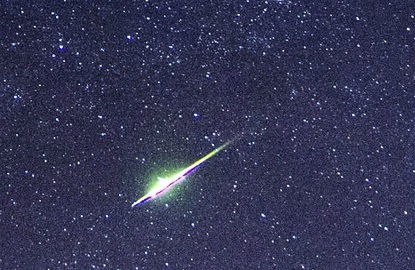 Chung had shot footage of what looks like a Perseid meteor exploding… resulting debris ring and all. This incredible video, shot early in the morning of August 12th, literally gave me chills. According to some in the know over at Universe Today this video appears to be the real deal. And although video of “persistent trains” (aw hell, I’m sticking with exploding meteors… it sounds WAY cooler) has been captured before, it’s rare and still stunning footage. Wow, what an amazing Universe we live in. Previous Post Previous post:Hey, where is MY kitchen of the future?? Next Post Dog Rap…. WOOF!